I often do I use it too a long-grain rice grown in Italy: the carolina. whether you use the rice cooker or the pot for traditional cooking. The only particularity is the addition in the water with which the rice of two ct will be cooked. 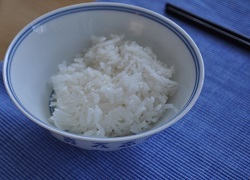 of grated coconut and a ct. granular broth (if you have some vegetable broth ready at home, use that, possibly diluted with a little water but respecting in any case, the proportion between liquid and amount of rice). 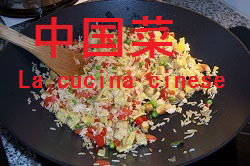 For the rest proceed as for the BaiFan (白饭), white rice with Chinese; as follows. if you use the appropriate rice cooker just add rice, water, grated coconut and vegetable granular broth mixed together in the container, cover and turn on the appliance. When the saucepan signals the cooking, add a knob of butter (about 2 ct.), Mix and serve directly in the dishes. At this point behave as for the rice cooked in the rice cooker! Ideal, for example, to accompany a curry dish, like this chicken! If using a rice cooker of recent production, you can prepare the rice even an hour before and then leave it in the pot lit: in the pan cooked automatically switches to warm function (check the individual device instructions). The rice cooker pot allows with a special basket, the cooking of small quantities of steamed dishes, simultaneously with the cooking of rice.